This PDF 1.4 document has been generated by Mozilla/5.0 (Macintosh; Intel Mac OS X 10_12_6) AppleWebKit/537.36 (KHTML, like Gecko) Chrome/61.0.3163.100 Safari/537.36 / Skia/PDF m61, and has been sent on pdf-archive.com on 10/10/2017 at 15:38, from IP address 97.99.x.x. The current document download page has been viewed 194 times. mutual interest. Below we highlight some of them. FI’s bootcamps in through the Star Fellows Program. Steve Wolfe’s support to help us secure the collaboration. CEO of Knotel, as well Ron Zori, for generously facilitating the agreement. wonder of space to millions. 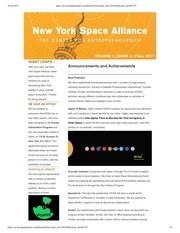 part of this group, please email scanavan@nyspacealliance.org. Alliance (Boeing and Lockheed Martin joint­venture rocket company). Sidney Nakahodo at the Frontier Founders Forum, September 7, 2017.
was most recently the Chief Operating Officer for CFA Society New York. innovation and managing a portfolio of mobile products across divisions. in receiving emails from us. If you do not wish to receive any more emails, you can unsubscribe here. This file has been shared by a user of PDF Archive. Document ID: 00683410.